I went into this with high expectations. I loved Meyer's Lunar Chronicles series and I had hopes that this one would live up to the hype. Unfortunately, I was disappointed in some aspects but not all. I enjoyed the different characters and how they came from opposite worlds. I always enjoy reading from two vastly different perspectives. Adrian and Nova were both very passionate characters who were both very stubborn and intent on achieving their goals, but I felt like I didn't connect to them as much as I would have liked. The story also moved pretty slowly at times, although it picked up more towards the middle and end. I didn't really feel much of anything-shock, frustration, excitement, annoyance, anger-in response to the characters actions or the plot twists or big reveals and when the ending came I kinda just felt...nothing, really. The storyline didn't appear to go anywhere and the character development felt weak, if not non existent. Nova and Adrian didn't appear to grow or change much at all. Nova did gain some new perspective on the Renegades and began to have doubts, so there's that at least. I felt like Meyers could've dove a lot deeper into both characters perspectives and given them a little more personality. There were parts where I sympathized with Nova and past, but other than that I felt pretty bored and unimpressed most of the time. Adrian was sweet and strong willed but it still felt like I barely got a glimpse into who he was. I liked some of the side characters-Ruby and Oscar in particular, and I would've liked to learn more about Adrian's dads and Nova's life growing up with the Anarchists. The plot just didn't keep me in suspense and I found myself waiting for more drama and conflict that never came or fell flat when it did. Overall though, I was interested enough to finish the book and I'll probably read the next book just to see what happens to the characters. 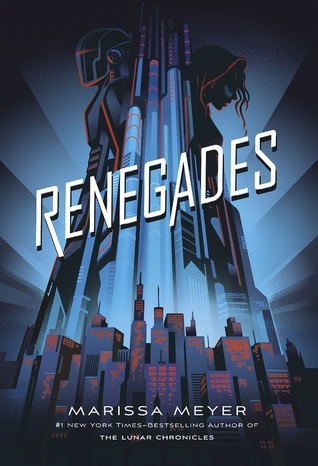 Sign into Goodreads to see if any of your friends have read Renegades.